Time for a tire change. I finally got a chance to pretty well wear out a set of Michelin Pilot Road 2 tires. Previously I had one that had picked up too many nails and been plugged too many times that I had to get rid of it. Second set was on a bike I sold, so this set was the ones I finally wore out. I got a pretty remarkable 13,510 out of them and was very happy with the performance of them. So you might ask, why not another set of PR2's then? I certainly would have if Pirelli had not offered up their "Fly Into Summer" promotion back in June. They offered up their new Angel GT in a deal where if you buy a rear tire, you get a free front tire. Normally a full set of tires will run $250-$300. 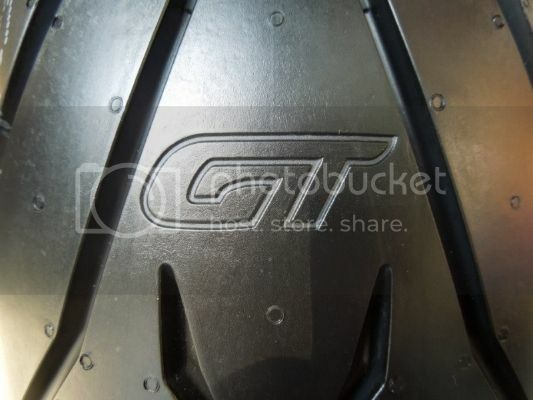 I ordered up my rear Angel GT from JakeWilson.com and it was $167.99 with free shipping. Add onto that, Pirelli drop shipping me a front tire for free and that's a deal that cannot be beat. With the old tires finally worn out it was time once again to get some value out of my Harbor Freight tire changer. An afternoon of sweat and curse words, and having to demount my new rear and remount it because I put it on backwards, and all was done. I did take this opportunity to swap out my valve stems with some sweet aluminum 90 degree valve stems from PJsParts.com. These make it much easier to check and adjust your tire pressure, especially the front one where the brake disks get in the way. Everything went pretty well and I'm happy with the new tires performance so far. We'll see how well they last. I picked up a tread depth gauge and will be updating the following chart monthly with my rear tire measurements. I live in Dallas and commute on the bike so we'll see the middle go out first likely. Noticed today the center is starting to show that it's about to separate. Still not completely to the wear bars even. I wore the PR2's well past the wear bars before this condition showed. In the end, got my money's worth since it was less than half price, but now that I have to pay for two new tires, I'm going back to the trusted Michelin PR2's. $264.83 shipped to my door for the PR2's via Jake Wilson again. Angel GT's would have cost $265.86 for roughly half the life.